Students have already completed 2 lessons, and the 3rd lesson is the lesson to use Ukezutsu. My students have spent 3-4 hours to complete this arrangement, which I was hoping for them to complete in two hours. 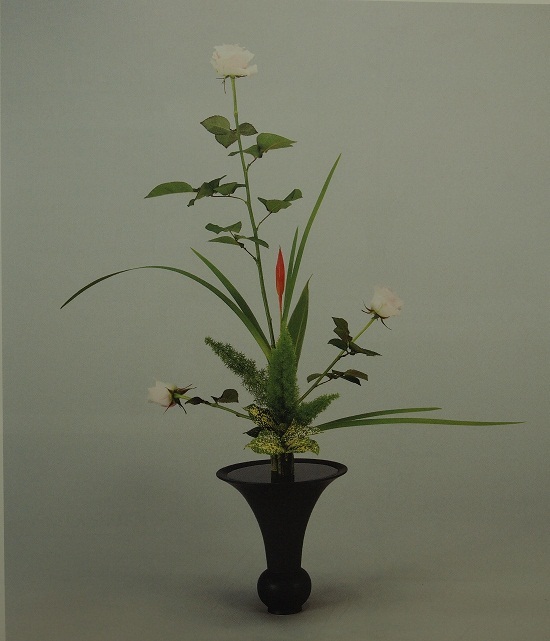 Here are other Rikka arrangements made by students taking the Introductory Rikka Workshop for First Timers (Beginners), Rikka Step by Step 1-2. Students had completed Rikka Step by Step 1-1 before. Students learned the engineering of how to construct Rikka in a quick and correct way. The materials for this Rikka were a little more difficult to deal with than the ones for Rikka Step by Step 1-1, but everyone handled each stem very well. Some students were reluctant in the beginning to learn Rikka, but now they say it is easy to learn Rikka through Kazuko’s “engineering” method. These are Rikka arrangements made by students taking the Introductory Rikka Workshop for First Timers (Beginners), Rikka Step by Step 1-1. The same introductory workshop was held twice in September, 2012. This class was the third one, and the last Introductory workshop untill the year 2015. This week, my students practiced Nijyu-Ike. For my student, Jo Ann, this is her first time to complete Nijyu-Ike without Kenzan at the bottom. She made her own Matagis from stick & wire. 4504We practiced two-stem Japanese Narcissus Shoka = “Denka” arrangement on February 5, 2013, by using common Paperwhite Narcissus. Unlike Japanese Narcissus, which is very hard to get here in Colorado at this time of the year, Paperwhite has a lot shorter and softer leaves. So, we were able to make only a very small arrangement, about one-foot tall. It was just a practice to maintain HAKAMA (white seath at the bottom) to show Narcissus’ Shussho (original character). Please click “Continue reading ->” below for more pictures. In our December 18 regular class, my students made a special flower arrangement dedicated to the young victimes of Sandy Hook Elementary School Shooting in Newtown, Connecticut. 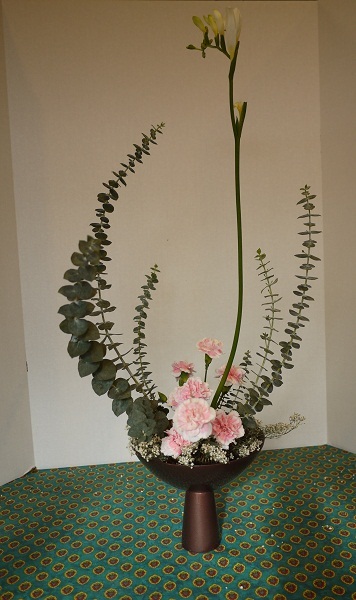 The arrangement was designed by me, Kazuko Kozai. The Eucalyptus leaves show the shape of two hands cupped together, the Pink Carnations at the lower base position indicate young victims, and the Freesia in the center vertically reaching the victims prayer to the heaven. 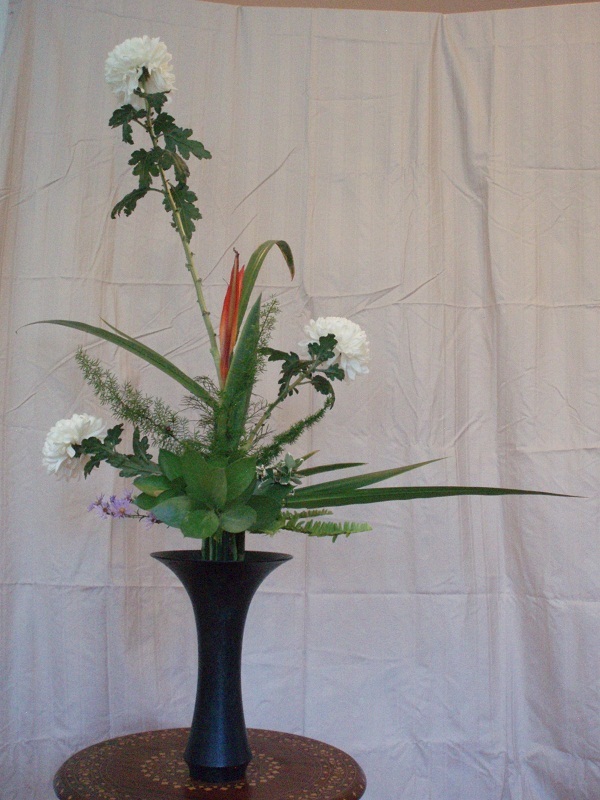 This is the Rikka Shofutai arrangement we made for the first class on September 9, 2012, using the tall Chrysanthemums. Kazuko will start offering the Basic Techniques of Rikka class starting in September, 2012. This class will be taught through a 5-6 class sessions to teach the basic of Ikenobo Rikka arrangement. The class will be offerred approximately once every two months. But, a student is expected to attend all 5-6 classes to be considered to have mastered the Basic Techniques of Rikka class.